Scottish students and their teachers now have a new canvas for their projects: CANVAS (Children’s Art at the National Virtual Arena of Scotland). This Open Sim virtual world will provide learners a space to display art projects while avoiding the administrative difficulties associated with other worlds blocked by school-system firewalls. The Consolarium of Learning and Teaching Scotland partnered with virtual-worlds developer Second Places to develop the showcase for student work. 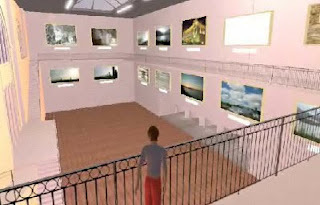 All 23 Scottish local authorities will have a virtual gallery for both still images and digital video created by students. Children using the virtual world can earn currency to spand at the gallery shop, where they can buy items to cusotmize their avatars' appearances. CANVAS also houses seminar space in an auditorium and a building where students (and faculty) learn about good behavior in virtual worlds. Educators often encounter resistance when proposing that they employ open virtual worlds, and some, like Second Life®, do not permit minors on their main grids. This initiative, however, allows administraors and teachers "to create our own bespoke virtual world that can be hosted on our servers so that we have full control over whom we allow in to view and interact in the world." With this technology in place, students ranging in age from nursery to high school will be able to log in and work on projects with their teachers and invited guests. This type of behind-the-firewall solution provides more evidence that educators and administrators can work closely to devise solutions that encourage multimodal projects in virtual worlds. Today my wife's kindergarten students do podcasts that are sent all over her county; tomorrow, perhaps, they'll be building content in limited-access virtual worlds like CANVAS.